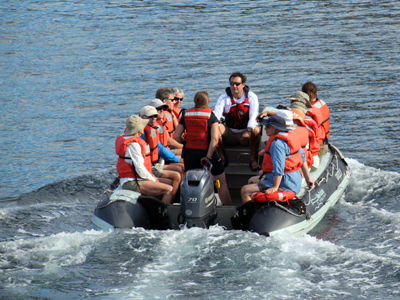 DAY 4: ABOARD THE SAFARI ENDEAVOUR — Our destination this day was Captain’s Choice—a surprise for us passengers. Capt. Barrett did not disappoint. At sunrise we cruised into Honeymoon Cove on the uninhabited Isla Danzante, which translates to “Dancing Island.” No one seems to know why it’s called that, but we discovered that the setting and day’s activities were cause for joy. Like most of the islands in the Sea of Cortez, Isla Danzante has cliffs plunging into the sea, punctuated by wonderful little coves with deserted beaches. Six to 10 million years ago, when the Baja California Peninsula broke away from mainland Mexico and formed the Sea of Cortez (also called the Bay of California), the land tilted, creating the dramatic landscape of mountains and beaches we’re enjoying. While hikers took off on the trail up from the water, we prowled the coastline in a skiff, casting an occasional glance to see their progress up the steep trail, but more often our gaze was directed into the water or the cliffs at sea level, where colorful crabs scuttled across the rocks. We could see 30 to 40 feet into the depths, so we were able to watch juvenile stingrays scooting by just under the surface, along with meandering schools of sergeant majors, mullet and some angel fish. The rugged cliffs 50 feet above the water were occupied by scores of pelicans, cormorants and yellow-footed gulls who left their perches to dive into the water after fish, creating a swirling vortex of birdlife. 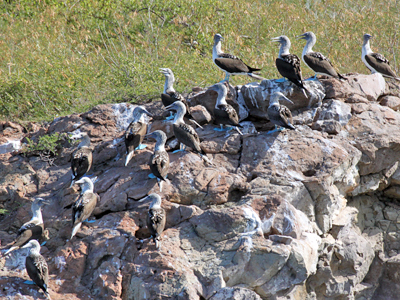 One of the women on board, an avid birder, anxiously scanned the cliffs with her binoculars, searching for blue-footed boobies. Those of us who had seen these remarkable birds in the Galapagos were delighted when she finally spotted a single one, his baby blue feet standing out against the grey rocks. Minutes later we rounded a corner and came upon 20-30 boobies resting on a cliff and feeding in the clear waters. 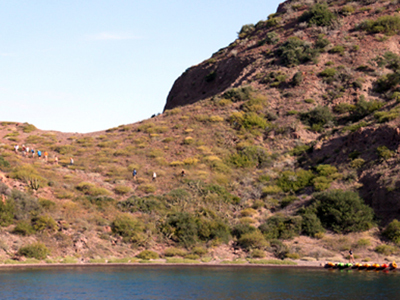 Trust the Sea of Cortez to reward patience with a show of its bounty. The hikers had reached Coyote Point, the highest point on the island, and were waving to us as we headed back to the ship. They not only had a birds-eye view of Honeymoon Cove, but also the Sierra de la Giganta Mountain Range, Puerto Escondido, and the Carmen and Coronado islands. We spent the afternoon snorkeling from rubber skiffs rather than the beach, and happened upon an amazing bunch of sea stars —remarkable not only for their numbers but also the variety of neon colors and color combinations. A clothing designer would have been breathless at the sight. As we climbed back on the skiff to return to the ship, I saw a small black mobula ray leap gracefully from the water. It was gone in a flash, but in May, hundreds of these lovely creatures can be seen catapulting from the water and belly flopping back on the surface. Our guides said it sometimes sounds like popcorn popping. There are plenty of theories, but no one really knows why they launch themselves into the air like that. I’d like to think it’s just for fun. I’m sorry we’re going to miss seeing the mobulas in large numbers, but we chose November because that’s when whale sharks congregate in the bay to feed. Speaking of feeding, dinner tonight was pork belly with apple butter or jerk spiced mahi mahi — with chile relleno for vegetarians. Afterward in the lounge, Chris the bartender treated us to a selection of cordials while Jeremy showed us how the geology of the Sea of Cortez came to be.